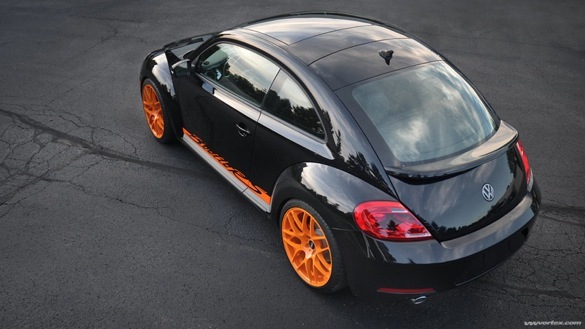 A GT3 RS… VW Beetle? 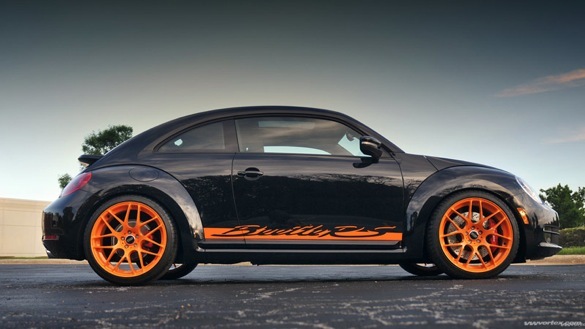 Like the lines of the new VW Beetle, but wish it came in a sportier package? 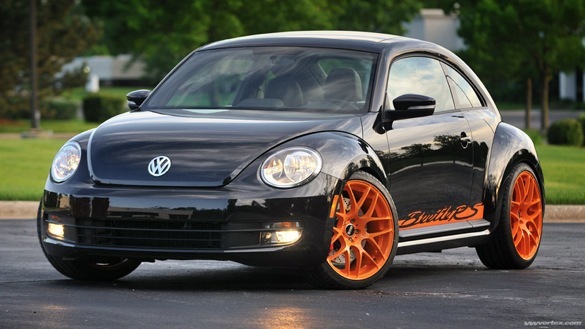 The folks over at VW Vortex feel your pain, and they’ve been tasked with creating a VW Beetle that demonstrates what tuners are likely to do when the car hits the streets. If you’re a Porsche fan, you’ll probably scream “blasphemy” at their shameless attempt to mimic the Porsche 911 GT3 RS; if you’re a VW fan, you’ll just smile and remember the once-common lineage of both cars. Clearly, a VW Beetle, no matter how well tuned, isn’t going to keep up with a Porsche 911 GT3 RS on a racetrack. On the other hand, a VW Beetle RS will likely be more comfortable, and it will certainly cost less to buy, build and maintain. Since this is just a non-street-legal prototype car, VW Vortex hasn’t done any mods to the engine for their Beetle RS project car. On the plus side, the coilover suspension (from H&R) is the same used on the Golf/GTI Mark VI, and the APR Brembo Stage II brake kit was also designed for the GTI, so the new Beetle will have aftermarket parts available as soon as it hits the market. VW Vortex found that a GTI intake also fit perfectly, although a GTI exhaust didn’t; in other words, at launch a custom exhaust will be your only option. This is Stage 1 of the build, which you can keep tabs on at VW Vortex. I’d give the car a win, but what’s your take: is it a sin to mimic the 911 GT3, or does the Beetle RS just make you smile?